As we’ve detailed in a previous Daily Content installment, in 1909 Imperial China adopted an ambitious purchasing program to obtain the ships for a modern fleet. This new fleet would have eight dreadnought battleships and twenty cruisers. Chinese representatives, Admiral Sah Chen-ping and Prince Tsai-hsun, apparently were shown sketches of proposed dreadnoughts by a number of shipyards, but they had placed no actual orders for battleships when the Chinese Revolution of 1911 brought the plan to a halt. That’s not the case for cruisers. The Chinese delegation ordered three training cruisers to the same design, one each from Armstrong, Vickers and New York Shipbuilding. Whether these counted among the projected 20 cruisers is not clear; one of them would be sold to Greece after the Chinese Revolution. 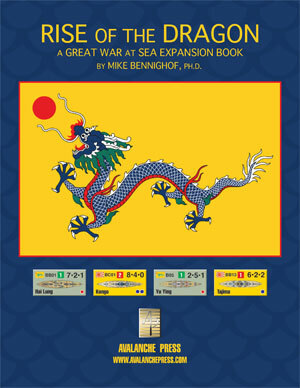 Our Great War at Sea: Rise of the Dragon includes this Chinese fleet that never was, with all eight dreadnoughts (plus one more) and all twenty cruisers not counting the training cruisers (because that interpretation meant more ships). It's a full-sized supplement, a vastly enlarged edition of the limited edition previously available only to the Gold Club. In addition to the training cruisers, the Chinese also ordered four cruisers from the Austrian shipyard Cantiere Navale Trieste. Those would be the only ships from the program actually ordered, and none were ever completed much less delivered. The four cruisers included three small, fast ships and one much larger cruiser. The small cruisers were to displace 1,800 tons, carry an armament of ten 4-inch guns and six torpedo tubes, and make 32 knots at top speed. That was very ambitious for such a relatively small displacement – the Austrian cruiser Saida, under construction at CNT at the time Chinese placed their order, carried a lighter armament on just less than twice the displacement and was only designed for 27 knots. Which explains how CNT got the order: the salesmen told the client what they wanted to hear, and left explaining why the project failed to someone else. There is no evidence that CNT’s sales staff went on to print wargame playing pieces. The larger cruiser would displace 4,900 tons and carry a powerful armament of four 8-inch (203mm) guns in dual turrets fore and aft plus fourteen 4.7-inch (120mm) guns and a pair of torpedo tubes. She would have substantial armor protection for her size, and make 28 knots. The Chinese ordered one ship, but indicated a desire to order more in the future. Neither design would have met its specifications on the indicated displacement, so they’re modified in Rise of the Dragon (as they were in Great War at Sea: Mediterranean, where they appear in Austrian colors). Based on Austrian plans to complete the ships for their own use, we’ve assumed that the small cruiser would actually weigh in at about 2,800 tons with fewer guns, and that the big cruiser would probably go about 5,500 tons with fewer 4.7-inch guns. The Chinese were definitely interested in the British Town class light cruisers, both in their meetings with British shipyards and Japanese builders, who offered near-sisters to the British ships as part of Kawasaki Heavy Industries’ pitch to build pre-dreadnought battleships in 1907. Powerful ships, the cruisers displaced about 5,500 tons (sub-classes varied slightly in size) with eight six-inch guns, a pair of torpedo tubes and a speed of 25 knots. And they had good armor protection, at least against other cruisers. The order placed with CNT showed a preference for two types of cruiser rather than a single maid-of-all-work: a small light cruiser to support destroyers in battle, and a larger one for longer-range scouting and patrol duties. The Town class would have filled the need for a larger cruiser, and if the Chinese had asked for a smaller companion the Active class scout cruiser would have filled their needs. The Royal Navy built both types alongside one another before going to a standard type cruiser to fill both roles, and had the Chinese accepted the bids of British yards these – or something like them - likely would have been the cruiser designs chosen. The German yard of Vulkan in Stettin had built a series of cruisers for China in the 1880’s and 1890’s, and usually received an order for one light cruiser out of each class of four built by the German High Seas Fleet. They pitched their services to the Chinese naval commission in 1909, but did not receive an order for cruisers; the Chinese did place an order with rival yard Schichau for three destroyers built to a rather outdated design. Had Vulkan received Chinese business – and if the Chinese were buying twenty cruisers – it’s a fair bet that their old crony Vulkan would have built some of them. They likely would have offered a design based on the Königsberg-class light cruiser Stettin, completed at Vulkan in October 1907 and the first turbine-powered large warship built for the German Navy. Despite the unusual cruisers ordered from CNT, the Chinese appear to have had a preference for completed and proven designs, as was the case for all of the destroyers ordered in European yards. China’s ship buyers (Sah and Tsai) showed a marked preference for heavily-armed cruisers, probably influenced by the success of Japanese armored cruisers in action against the Chinese in 1894-95 and against the Russians in 1904-05. Italy laid down a series of big armored cruisers between 1904 and 1907, one of which was ultimately sold to Greece. These designs would have been available to China as well, though the commission only ordered four destroyers from Ansaldo. In Rise of the Dragon, they’ve placed their purchase orders for a pair of armored cruisers as well, based on the Royal Italian Navy’s San Giorgio class. While the Chinese desired newly-constructed ships, no doubt due to the greater opportunities for graft, they would have been very familiar with the British Monmouth-class armored cruisers from the ships’ service on the China Station. Purchasing a pair of them would have given the Chinese two modern ships with which to train and familiarize while the new warships remained under construction. While the Royal Navy disliked selling ships from its active roster – no one wanted to hint to Parliament that perhaps the Navy did not need so many – the Monmouth class had been considered too lightly armed for their size and expense (hence their assignment a world away from Britain) though their fine lines did yield very good speed for ships without turbines. Don’t miss your opportunity to put Rise of the Dragon on your game table! Join the Gold Club and find out how to get it for your own collection! Mike Bennighof is president of Avalanche Press and holds a doctorate in history from Emory University. A Fulbright Scholar and award-winning journalist, he has published over 100 books, games and articles on historical subjects. He lives in Birmingham, Alabama with his wife, three children and his dog, Leopold. Leopold is a good dog.